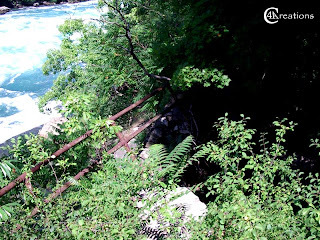 Located on the American side of the Niagara River, not far from the Queenston/Lewiston hydro plants, lies a hiker's paradise called The Devil's Hole. 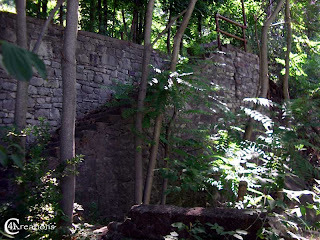 Carved into the bedrock by the eroding path of Niagara Falls itself, this sheltered cove was the site of a 1763 massacre in which the Seneca Indians ambushed and killed over 80 British soldiers. Today, it's the entry point into a Tolkien-esque world of beauty. Those who follow the winding stone staircase down through the trees find themselves upon a remarkably flat, too-even-to-be-natural, solid path of stone. More on that later. 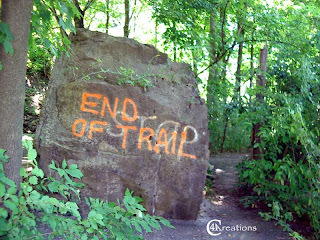 Unlike the meandering trails of the Canadian side, which demand that you climb up and down, into and out of immense rock formations and ancient trees, a hike along the American side is like a walk along the boardwalk. With a sheer drop off to the raging rapids on one side, and a loose jumble of rocks leading up to a jagged cliff-face on the other, and you wonder why anyone would have taken the time to carve out such a path. But, again, more on that later. 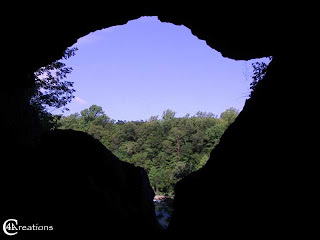 One of the few exceptions to the view is a limestone cave further down the path. Cold, wet, and looking as if were literally carved out with an ice-cream scoop, the cave is beautiful to behold. Its walls are veined like marble, revealing striations of colour in the bedrock, with green bits of mould and algae coating the bottom-most portions of the wall. Perhaps the most rewarding aspect of the cave is the spectacular view upon your exit. 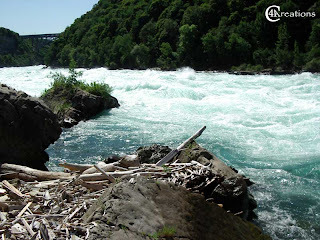 Continue along the trail, and you will continue to be rewarded with stunning views of the whirlpool rapids, which are so close you could reach out and touch them. The hike from here requires a bit of fancy footwork in places, where falling rocks have covered or altogether obliterated the path. You really have to wonder why anybody would build such a thing but, again, more on that later. It can be a taxing hike to the end of the trail, so much so that you'll likely be tempted to obey the immense STOP sign. Anybody with even a sliver of curiosity, however, must wonder why the trail continues. Is it unsafe? Actually, it is. Are they trying to hide something? Actually, they are. Should you allow curiosity to chase the cat? Absolutely. 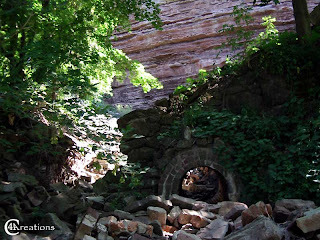 Otherwise, the oft promised later will never come, and the ruined beauty of Devil's Hole will never fully be revealed. Before long, you'll come across signs that the pathway was once more than just that. The ruins of an iron railing are still visible in spots, bent and twisted, sticking out of the broken ruins of a stone wall. The trail begins to disappear here, buried by rock, and overgrown with forest vegetation, without the benefit of booted feet regularly passing through to keep it clear. Ignore common sense, throw caution to the wind, and proceed with the adventure. You'll soon discover that's a sentiment that has survived over a century. Soon enough, you'll stumble upon a final staircase down to the river. Although little of the railing has survived, the stairs themselves are in remarkably good shape. 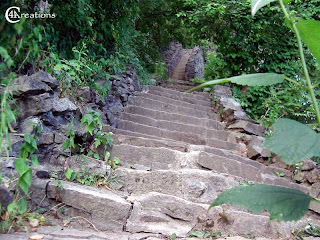 Having first seen the passage of human feet in the summer of 1895, these stairs marked the point where tourists boarded the Great Gorge Route Railway. That remarkably flat path of stone that brought you here? That was the bed of the railway. Continue on just a little bit further, and you'll come across further evidence of what an immense (and immensely foolish) undertaking the railroad was. Little remains of what appears to have been a drainage tunnel, likely intended to divert runoff away from the tracks. Given the history of the railway, it's little surprise. 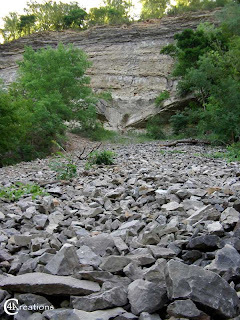 In 1899, a one thousand ton rock fall angrily pushed yards of track into the river. In 1907, an avalanche of ice killed nine people. In 1915, thirteen passengers were killed and over sixty injured when an overloaded trolley derailed and hit a tree. In 1917, twelve people were killed and dozens more injured when a trolley derailed, rolled down a thirty-foot embankment, and landed upside-down in the river. Finally, in 1935, over five thousand tons of rock came crashing down to destroy over 200 feet of track. The track was never repaired or replaced. When the rocks above are falling, and the water below is more white than blue, you may wonder how anybody thought a railroad was a good idea, but you also have to say thanks for opening up the way.